Roofing heat cables & auto on/off temperature, moisture sensors. Gutter heat cables & auto on/off temperature, moisture sensors. So What Exactly Causes Ice Dams and Icicles? Ice dams form along the roof's edge, usually above the overhang. Here's why. Heat and warm air leaking from the living space below melt the snow, which trickles down to the colder edge of the roof (above the eaves) and refreezes. Every inch of snow that accumulates on the roof insulates the roof deck a little more. This keeps more heat in the attic, which in turn makes the roof even warmer and melts more snow. Frigid outdoor temperatures ensure a fast and deep freeze at the eaves. One of the first signs to look for is hanging icicles forming at your roofing eves. The worst ice dams usually occur when a deep snow is followed by very cold weather. Step 1. Using a roof rake, remove snow 3-4 feet from the edge of your roof, being careful not to damage the roof covering or to allow snow to build up around walking paths or to block emergency exits. Thereby fully exposing the ice dam and allowing sunlight to help heat up and weaken your roof ice. Step 2. To finish removing ice dams; is to melt it using calcium chloride ice melt, thereby restoring the proper water shedding function of your homes roof or gutters. Hire Team Vinyl and Roofing Co. professionals to clear your edges a minimum of 3-4 ft every large snowstorm if possible. This will prevent ice damming until you can solve the problem with more permanent solutions we discuss below. The theory is obvious. No snow or ice, no leaking water. The worst of all solutions is untrained and inexperienced people chipping ice by attacking mounds of roof ice with ice picks, crowbars, and chain saws! Unfortunately, this method threatens life, limb, and roof. 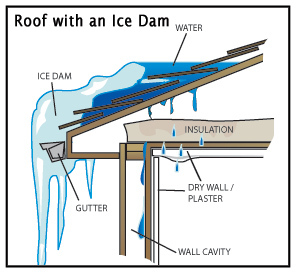 The way to stop ice dams from forming is to keep the entire roof cold. 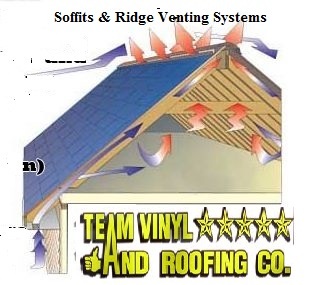 In most homes this means blocking all air leaks leading to the attic from the living space below, increasing the thickness of insulation on the attic floor, and installing a continuous soffit and ridge vent systems are the best way to eliminate the problem. Be sure that the air and insulation barrier you create is continuous. "Team Vinyl and Roofing Co., Hinsdale, N.H have completed several jobs on my home. They installed new roofing shingles; new gutters and recently Chad and B.J installed heat cables in the gutters. The work was excellent and the workers were well mannered, pleasant and answered any questions I had. Stay warm and safe inside your New Hampshire or Vermont home this year and have your roof ice removal trained professionals from Team Vinyl and Roofing Co. of Hinsdale NH clear your roof of damaging ice and help solve your problem with our permanent solutions. Team Vinyl and Roofing Co. of Hinsdale NH has been serving Cheshire and Windham County since 1985 and looks forward to removing ice dams from your house or building. For quick service, and a full evaluation of your home, Call us today to learn more or fill out our quick form to receive your FREE, no-obligation estimate. Are you in or near one of the above locations, and you're not seeing your city or town listed? Contact us today to see how we can help!